The ASPCA, at the request of the Monroe County Humane Investigator and the Monroe County Sherriff’s Office, is assisting with the removal and sheltering of 15 dogs and a parakeet found living in an overcrowded mobile home in rural Kendall, Wisconsin. As a result of an investigation initiated by Monroe County Humane Investigator Bekah Weitz, a search warrant was executed this morning for the removal of the animals. 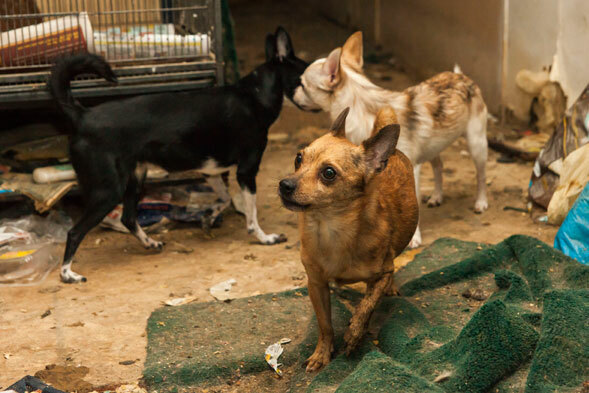 Our Field Investigations and Response (FIR) team encountered a devastating scene: 15 dogs—including Chihuahuas and Pomeranians—were found living amongst feces, trash, and rotting food in a poorly ventilated, cramped environment. Multiple dogs exhibit signs of neglect, including dental disease and dehydration, among other medical issues. Responders also discovered animal remains on the property. “The dogs were living in filth, and our immediate goal is to transport them to a safe place,” says Kyle Held, Midwest Regional Director of the ASPCA’s FIR team. The dogs are currently being taken to an emergency shelter to receive care and treatment from our medical experts until suitable placement options are available. Agencies including Texas Humane Heroes in Leander, Texas, have deployed responders to assist with the removal and sheltering of the dogs. PetSmart Charities® provided supplies, including pet crates and food, to support the rescue operation. These dogs are safe now, but their long road to recovery is just beginning. With your help, we can give these animals—and the thousands of others who still need us—a chance at a better life. Please consider making a gift today. Stay tuned to aspca.org/blog for further details about this developing case.